Nose: Warm, crunchy toffee and deep citrus notes. Marmalade on toast with fine orange liqueur balanced by dry, almost smoky oak tannin. Taste: Intriguing layers of light tannin, underpinned by rich notes of vanilla pod, fine leather and Havana tobacco. Develops into a sweet, velvety mouth-feel with spicy hints of cardamom and nutmeg. Finish: Warm, delightful long finish. First sampled on my way through Edinburgh Airport as these were originally released exclusively to Travel Retail. 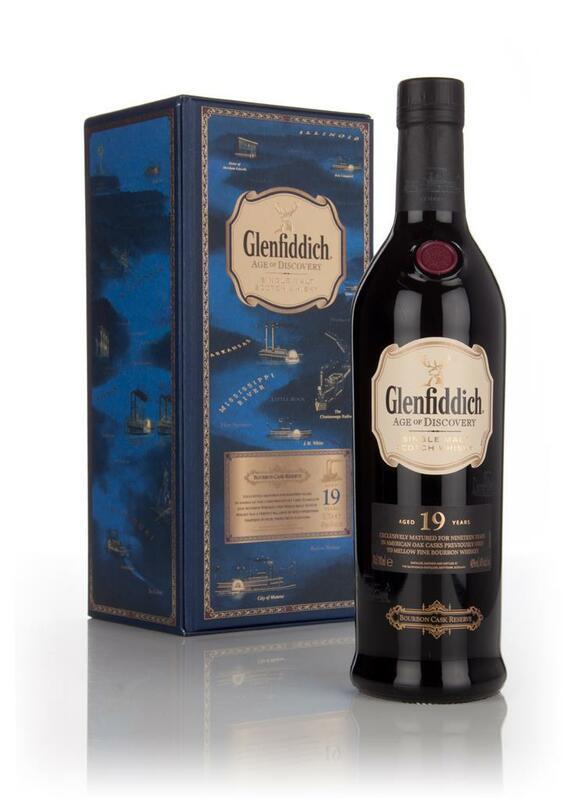 A 19 year old Glenfiddich unusually bottles from a single cask type maturation, in this case ex-Bourbon casks. A reasonably enjoyable and simple Bourbon-cask matured Glenfiddich, worthy of inclusion into their 19 year old Age of Discovery series, sits nicely as a comparator for the Madeira Cask and Red Wine Cask expressions. A nice example of how ex-bourbon cask maturation can work really well in older expressions, a good balance between cask and spirit characters in here too. This sounds like a nice whisky. I like the 12 and it’s fruity notes. I’m beginning to like the 15 the more I have but I’ve yet to try any others from Glenfiddich.